Momma Brooks decides to pass on a chance to escape the sinking Neptune Cruise Ship and search for her husband and children before it’s too late in Nightmare on the Pacific. 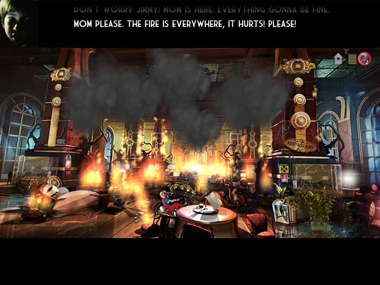 She is no doubt the original Super Mom as she puts out fires, clears debris with a hacksaw and climbs ropes to maneuver from room to room in this suspenseful Hidden Object game. So how did this incredible woman get into this situation anyway? Well, she was enjoying a pleasant family cruise holiday with her husband, son and daughter when a disastrous hurricane struck. During the stormy chaos, the mother is separated from her family. She is left with no choice but to brave the dangers of the battered ship and find all her family members before the raging storm claims the Neptune forever. Playing the super mom character in Nightmare on the Pacific was totally empowering and we absolutely loved the fact that this game took place aboard a ship as this is a rare venue for a Hidden Object game. The graphics, sounds and voice acting were magnificent! The creaks and screeches of a collapsing ship and the sound of the rampant storm had us wiping ocean spray off our faces! 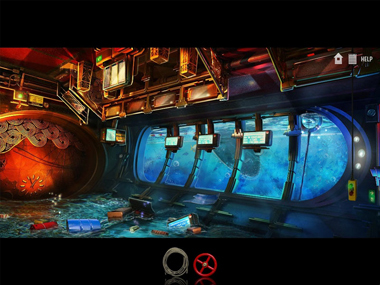 Nightmare on the Pacific consists of basic Hidden Object scenes and an assortment of challenging puzzles that will keep you on your toes like jigsaws, machine repairing and tile sliding puzzles. You must achieve all these missions as you navigate the ship in search for your family members. After every Hidden Object challenge, you’ll be awarded a least one thing that you will have to use later to advance in the chapters. For example, you’ll receive a screwdriver which you can later use to reassemble a broken control wheel. As there is a lot of backtracking in this game from room to room of the ship, the in-game diary is a great feature that you should definitely use. You can find it in the top right corner of the screen. It allows you to keep track of all the missions you accomplish in the game, see your location on a map, see where you’ve been and where you should go next. If you ever feel lost at any point in the game, scan the screen for objects or areas that are twinkling. These are items that you should notice or need in order to move on. 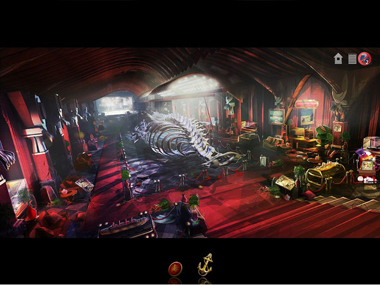 Regarding hints in Nightmare on the Pacific, they are only available during the Hidden Object challenges. The good thing is, they only take a short time to recharge. If you’re looking for an enjoyable Hidden Object game with a unique game setting, Nightmare on the Pacific is a wonderful choice. Our only complaint is that the experience ended all too quickly. We completed the game in a bit less than two hours, which was great – but we were hungry for even more ocean excitement. So snap on your lifejacket, gather up some courage and try it now (motion sickness pills not included :)). Mi estimada Michelle ustedes siempre me mandan juegos nuevos los fines de semana y estoy muy agradecida pero yo nunca puedo jugarlos,porque cuando lo hago me sale la pagina principal de juegos que anteriormente ya he jugado.Muchas gracias por hacerme la vida mas placentera. Comment. have no comment to say thankyou. I love playing all the games but i do not have a credit card to purchase them, but thank you for letting me play them. I thought this was an awesome game. I enjoyed it very much. I don’t appreciate your pop ups when I’m using my computer. You are messing up my work and I’m really tired of it. Please stop sending your pop ups. PLEASE cancel this program off my Computer!! I don’t use it nor want it. When I’m in the middle of another program it pops up and when I try to exit it, it takes me back to my desktop screen and I have to re-start the program I was in the middle of. Again, Please cancel your program for me. Will you please take me off your mailing list, I’m not interested in you site . Thank you. would like the walkthrough for Campfire lengends keep getting stuck, if available please show. I am playing this game now. So far so good. It is an interesting game. I LOVE THESEHIDDEN OBJECTS GAMES. I PLAY THEM AT LEAST 1 TIME A DAY. THANK YOU FREE RIDE GAMES., YOUR AWESOME. This game i can recommend,ive played this and enjoyed every minute of it,so if your thinking of trying go for it you wont be disapointed. I LOVE ALL THE FREE GAMES BUT THE ONLY THING I HATE IS STUFF BE POPPING UP WHILE I’M TRYING O PLAY THE GAMES OR THE GAMES CAN NOT BE PLAYED…. I’ve played this one …and it was amazing… it took me quite a few time of logging on and off because my eye’s got tired ..I think that the art work is awsome …keep up the good work ! I’m a widow who spends a lot of time playing these Free Games …thank you so much !!! found it to be a great hidden objects game and the mini games were great fun,loved it. I’m not going to say anything about this game. However, I have a request. I’d love to see more word games on your game board. I’d also like to see Cribbage there. I love Text Twist & was delighted to find it. How about Crozzle? Didn’t really enjoy this game. I got so far and then the game wouldn’t let me go any futher…I just found it boring. The games that you have in your catalogue are impresive! l love this game i think its one of the best. I love these Hidden Object games, I don’t think there are many left that I haven’t played. I try to to play the game it a little hard. Does it come with strategy guide to help when you get stuck or you send me a cheat sheet for the whole game. Thank you much. This game looks interesting and the graphics look really good! I think I’ve played almost every Hidden Object Game that you have. And I can’t wait to play this one. Thanks for another great game (I’m sure this one is great as well). This game a interesting bt don’t still the game. I would like to experience all the game I can access. I want to play these games!! !